When Tammy Gallegos Daughtry (BA '92) moved from Denver, CO to Fullerton, CA to attend Hope International University (HIU) she was looking forward to four years of sunshine in warm Southern California. She had no idea that her time at HIU (then called Pacific Christian College or PCC) would lead her to working with prestigious companies like Warner Brothers and to impacting the lives of parents and children across the nation through her very own ministry, Co-Parenting International. "I can neve imagine my life without PCC," Tammy said, "and I carry that with me in every aspect of my work and life today." The road to where she is now began when Tammy started at Hope. Since she wanted to study the music business and record company operations, Tammy took a specialized contract major with Belmont University in Nashville, TN. After studying for four years at HIU and a year at Belmont, she graduated with a B.A. in Music Business and an A.A. in Music Education. "This was the perfect launching pad for me to work in the music industry," she said. She was hired upon graduation to work in Capitol Records' Sales and Marketing office. "This began an 18 year professional career in the music industry and an opportunity to work in events, marketing, promotions, artist management and eventually own my own event marketing company, Bennett's Events," she said. The work came naturally to Tammy after her experience on ASB at HIU where she fell in love with event planning. "I was in my happiest place ever as I realized I was made to do events and that I was really good at them," she said. If you don't believe her just look at the list of companies she's work for: Capitol Records, Spectra Music, Sparrow Music, Word Records and Warner Brothers. Only a handful of years after planning the Sadie Hawkins Dance at Knott's Berry Farm and the Spring Banquet on the Queen Mary at HIU, Tammy was putting together the Revlon Pre-Grammy Concert and the Hispanic Prayer Breakfast with President George W. Bush. All of a sudden, her life took an about turn in 2001 when Tammy went through a difficult divorce. Worried about how her then two-year-old daughter Angelia would be affected by being raised in two households, Tammy searched for resources on co-parenting but came up empty. By 2003 she felt a strong call from God to help other parents like herself, so she founded Co-Parenting International. She provides co-parenting classes and seminars all over the country and she also speaks about single parenting, step parenting, help for adult children of divorce and how churches can help in the process of reaching out to non traditional families. In addition, Tammy is on the Board of Directors for the Nashville Area Association of Christian Counselors, the YMCA of Middle, TN, and the Tennessee Christian Chamber of Commerce Events Committee. In the summer of 2011, her book "Co-Parenting Works! Helping Your Children Thrive After Divorce" was published by Zondervan, something Tammy hopes will bring the help and healing to people nationwide. She has spoken about co-parenting on TV, radio and written over 80 articles for magazines and other publications. She said she's does all of this with one goal in mind: "To be the voice for kids in divorced families and help their parents understand what they need to have a whole and healthy life." Tammy is all about perpetuating a message of hope whether through Co-Parenting International or as Director of Admissions Events at Trevecca Nazarene University. In the latter position, she seeks to emulate the examples of love, leadership, generosity and Christ-centered living she saw at Hope. "What I encountered at PCC were loving and wise professors, open and honest mentors and people who were willing to be real and open with me as I began to understand who I was 'in Christ,'" she said, specifically mentioning the impact Professors Steve and Cora Alley had on her. "I try to love my students the same way," she said. "I take the unscheduled time to listen to their stories, I open my home to them, I let them see my life with hopes that God will use me in the same loving, powerful way." She also hopes to see many other students find their home and passion at HIU like she did. "If a student is looking for an authentic Christ-centered university to grow deeply in their walk with God, to be challenged academically, spiritually, socially and to become a "servant leader" in all walks of life, then this is the place for them," Tammy said. "If a student is interested in being known and part of a true real-life community of believers who will challenge you and walk life with you, then come! If a student is hoping to find lifelong friendships that will stay with you forever, then this is the place for you!" Tammy lives in Nashville, TN with her husband Jay and four children. 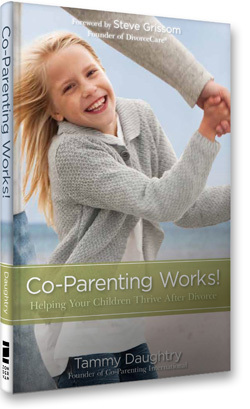 Learn more about Co-Parenting International by visiting http://www.coparentinginternational.com/ and read about Tammy's book here.